After a number of years in the portable toilet world we began to realise that there was a massive gap in the portable toilet market. Talking through customer’s requirements it became clear that a lot of people wanted something a little more than a single toilet but just could not warrant spending so much on a luxury trailer. It was then that our “mid range” trailers were built! All our toilet trailers have been designed and built in our workshop to ensure that the feed back we have received from our customers was transferred directly into the design of the trailers. We have basically taken the shell of a luxury toilet trailer with the eye for detail you might expect and added a plastic toilet and sink in order to keep the manufacturing price low which obviously keeps the hire rate low. 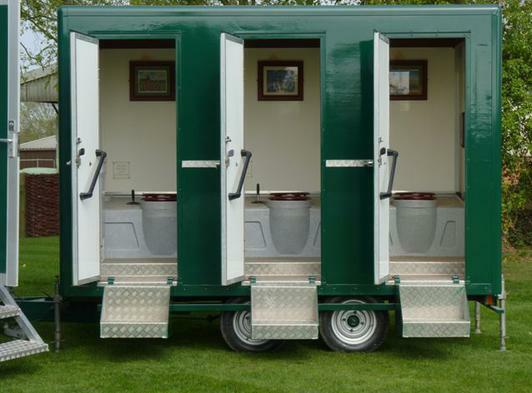 We have two designs of fully self contained trailer toilets, one has four cubicles and the other three. Both these trailers have cold water, soap, paper hand towels, mirrors and full lighting. These units were built to fill a void in the market between single plastic toilets and very expensive luxury trailers, they are a fantastic alternative for those wishing to have something smarter than the single cubicles but who can not justify the expense of a unit with piped music and gold taps! Our helpful staff will always make sure that they deliver to your specifications.